The Somnians begin inhabiting human bodies aboard the Galactica; the stand-off on the prison barge continues. On page 1, notice that, during his vision, Adama's eyes have reflections of 1) his own face in his left eye, and 2) human skulls in his right eye. The narrative on page 1 implies that Commander Adama was present for the destruction of the Fifth Fleet, but according to "The Living Legend" Part 1, he was not there. Probably the writers confused the term with the rest of the Colonial fleet that was destroyed during the Cylon attack on the Colonies in "Annihilation"; the Fifth Fleet was virtually wiped out a couple yahrens before that at the Battle of Molecay. Page 1 describes Commander Adama's stress as he is now responsible for the survival of the entire human race. But actually he's only responsible for the survival of the Colonial humans; the fleet has already encountered a number of other worlds on their journey which hold human settlements/civilizations. On page 2, Starbuck insists he's all right to Apollo after his hallucination on the alien derelict, claiming it must have been "a relapse from all that fumerrelleas." Despite the odd phrasing and spelling, he must be referring to his smoking of fumarellos (cigars). He was seen smoking one in the shuttle just before launching for the derelict and, in fact, is smoking one as they speak! Still, I'm not sure what he means by "relapse" unless fumarellos are known to have hallucinogenic properties, which seems unlikely considering he's been allowed to smoke them while on duty! It could be just a joke, Starbuck's way of keeping out of an examination in the life center. 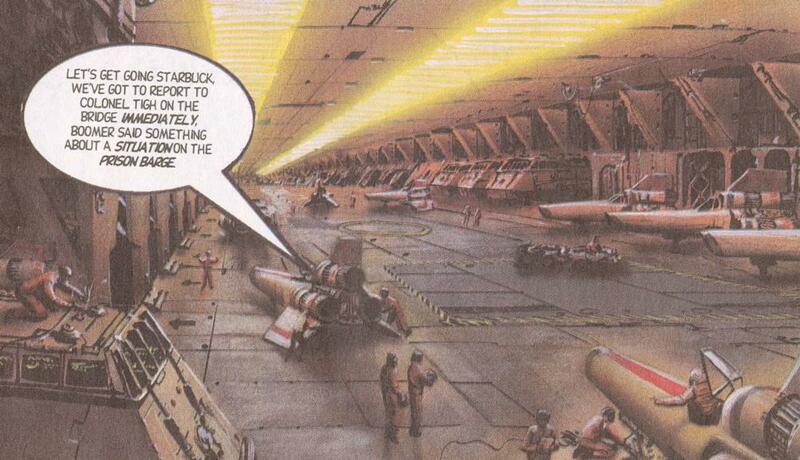 In the background of panel 2 on page 2, in the landing bay, there appears to be some sort of wheeled vehicle. It may be the same (or similar) model as the vehicle used by the Colonials on the planet Sectar in "The Magnificent Warriors", or it may be the same type of vehicles seen in use within the hangar itself on pages 3 and 19. On page 3, "Ovions" is misspelled "Ovians". A nice open view of the Galactica's landing bay is depicted on page 3. On page 5, Dr. Salik seems inspired at his nurse's suggestion, that Dr. Wilker's symptoms of normally unused portions of his brain working overtime almost seem to be an indication that his brain is acting as a receiver of some kind. But Salik himself already made a similar statement about Commander Adama's symptoms in "Prison of Souls" Part 1! Shouldn't he recognize what are essentially the same symptoms in Dr. Wilker now? On page 11, panel 1, there is an image on one of Omega's screens that appears to be a canyon or something on a planet's surface. Why would such an image be displayed now? The Galactica has not been depicted in this story as investigating any planetary bodies. On page 6, it is seen that there are a number of living humans being used for experiments on Vulpa Six's baseship. Where did these humans come from? Were they captured in the Colonies after the Battle of Cimtar over a yahren ago? Have they been held for even longer than that? Or were they captured on one of the human settlements discovered by the Colonial fleet on their journey? If so, have those worlds been otherwise wiped out by the Cylons? Why are the human captives of the Cylons being effected by the Somnian wave when most of the humans of the fleet are not?